After cheekily slipping through the German lines in the last game, the men of 49th Infantry Division now have to roll up their sleeves and get to grips with 12th SS properly. The job is to eject the Hitler Youth lads from the town of Fontenay. The morning mist is still hampering the British navigation, but they’re well supported with artillery, engineers and plenty of men. The Germans are stretched thin, expected to hold a line with too few men, although they have got tanks from their panzer regiment bulking up the line. Can the Germans give the attackers a bloody nose and fall back in good order? Or will the big British attack of Operation Martlet continue to take ground? The dust cloud from the artillery hung in the sky above the stone houses of Fontenay. Rounds were still tearing overhead and landing with a thump on the German lines. Better them than us, thought the Royal Engineers Sergeant as he smoked a cigarette in his hatch. The Churchill AVRE’s twin-6 engine chugged away behind him in the mid-morning mist. He thought it looked like it was starting to lift. Good. He’d seen the infantry go up already, the plan was for them to get into contact and their lanky young Lieutenant would send a runner back to guide the AVRE to any German strongpoints that needed the RE’s special brand of attention. The last few artillery rounds flew overhead, and the Sgt heard the distinctive crack of smoke instead of HE impacts. End of the barrage. The British are pushing into the town of Fontenay proper now, and the area is dotted with stone houses and barns, country lanes, hedges, small woods and orchards. Both attackers and defenders would have plenty of concealment, and the two-storey Norman buildings offered good fields of fire to machine guns and spotters. The area is a little more open towards the German rear, allowing support weapons or tanks to dominate the open ground along the western table edge. The British forces would be advancing along the axis of the paved road, along which the Germans would be able to fire the length of the table. The British patrol phase started with their markers fanning out from their entry point by the road, getting three free moves. 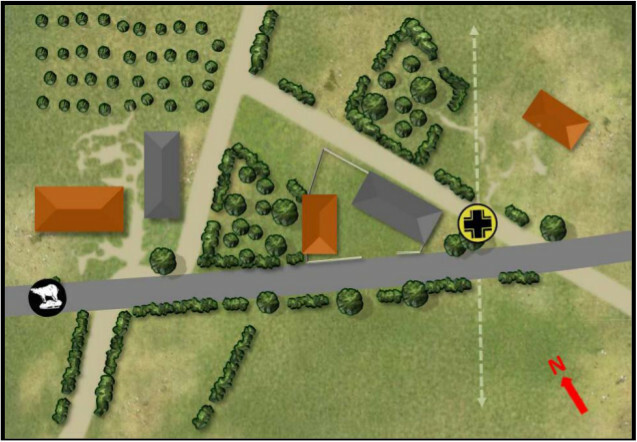 Germans moved up through the woods and houses in the centre, and the British pushed a marker up the road to quickly pin one of the German markers, then started to swing their efforts over to the left flank that had better terrain for attacking. The Germans brought a couple of markers up on that flank and locked them, ending the patrolling. German JOPs went into the rearmost house( which gave good fields of fire across most of the table), with another behind the barn at the crossroads, and their third behind the small square wood to the north. The British put one in each of the two buildings at their end of the table, and one in the orchard. The game is “Attack/Defend”, where both sides objective is to force their opponent to withdraw, while keeping their own force morale above 3. Planning for this one is made a bit of a guess by the lingering morning mist. The attacker can’t count on anything in particular turning up. So I didn’t plan anything fancy. I’d called for an AVRE and a Vickers gun that I could put into a building, hopefully putting some hurt onto the forward German positions. If I got troops on early I’d try and rush the German JOPs, if not I was content to hunker down in cover and skirmish with them to see if I could create an opportunity. I couldn’t count on having enough men to develop a serious attack, but even if a win wasn’t on the cards I was hoping (as long as I got the AVRE on) that I could flatten some buildings and cause enough German casualties to pull out with a losing draw. Then I’d come back in campaign turn 3 when the mist has cleared but the Germans are still getting hammered by the Royal Artillery, giving me a serious advantage in the first turn of the game. The Panzer IV was a risk, I’d need to keep the AVRE away from that beastie if possible. The Royal Scots Fusiliers kicked off their attack by putting their Vickers gun upstairs in a stone barn where it could see down the table, and the platoon CO deployed with it to direct it’s fire. Undeterred by the mist a rifle section led by the platoon sergeant moved up through the orchard on the left flank. Everything at the German table end seemed quiet, but taking no chances the British 2″ mortar fired some smoke up the table near a farmhouse to cover another rifle section as they double out of the barn and ran up towards a small copse of trees. Eager to hedge against the effects of the mist the British force called up yet more men, and another rifle section came up through the orchard while the first one dashed across the road to their front and bellied up to the hedge on the far side. That was plenty of infantry on-table, time to bring up the armour. Again, the mist failed to affect British plans and the AVRE rumbled onto the table near the road (but not so near it could be seen along the road!). That was a total of eight passes from eight attempts on a 4+. This turned out to be something of a foreshadowing of the dice rolling in this game. In short: British good, Germans bad. So far Phil playing the Germans was keeping very cool and not attempting to deploy his troops. Giving me enough rope to hang myself? British luck has so far been producing several double phases which I used to push sections up, although the dice gods overcooked it a bit and I threw a triple six, ending the turn and removing the effects of the barrage on German deployment. Predictably the German response was for several MG42s to pop up. One on a tripod opened fire from a ruined house at their end of the table, while a panzergrenadier squad emerged from the wooden barn (lovely paint job on the Renendra barn!) and opened fire on some Jocks who had just leapt over a brick wall and were caught in the open. A couple of riflemen went down, and the SFMG crew swung their weapon around to join in, but I played a CoC dice to interrupt and the riflemen piled into the kitchen of a farmhouse in a disorganised mess, dragging their wounded. The Germans at the barn ducked back out of sight, happy with their little hit-and-run effort. The tripod gun in the ruined farmhouse would be a major obstacle to any British advance up that flank, so a rifle section opened up on it, and the MG replied. Seeing that they’d need help the infantry lieutenant waved out the window at the AVRE and pointed frantically, in response the big tank grumbled across the road and mounted the hedge on the other side, moving up to tackle the gun. As it turned out, they needn’t have bothered as the fire from the MG42 was only moderately effective. A couple of riflemen were hit and a small amount of shock put on the section, but the platoon sergeant was able to keep them fighting, even though he took a light wound himself that knocked off a command initiative. In a display of superior musketry the rifle section hit two of the five men manning the gun, and the platoon’s light mortar dropped a smoke round right in front of it, ending the duel. The German crew packed up their gun and doubled downstairs, heading for an alternate position. Meanwhile, the German armour had arrived and the Panzer IV crawled up the road in first gear, stopping briefly to put 75mm HE rounds into the white farmhouse where the forwardmost British section was tending their wounded. No casualties resulted, but shock was starting to mount, and it looked like the section would have to abandon the house and pull back. 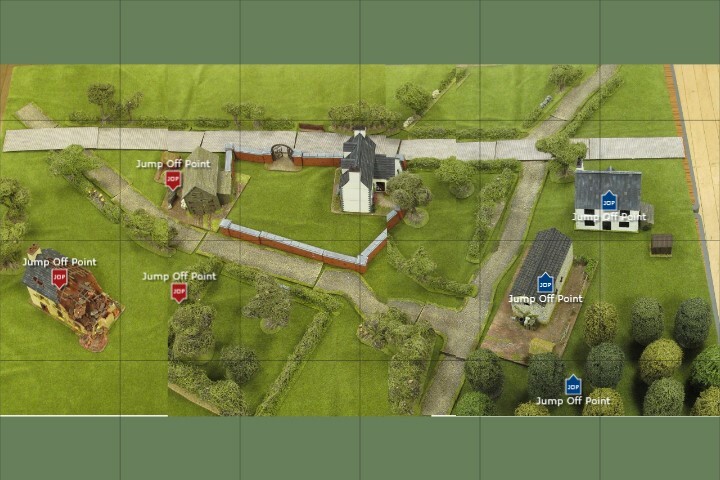 Sensing that the firefight was about the be won or lost the Germans deployed a squad into the hedgeline near the ruined house to keep British heads down while the SFMG redeployed. Unfortunately for that German squad the Churchill AVRE pulled around the corner of the nearby brick walls and wasted no time punching its petard mortar at their position in the hedge. The carnage was incredible, chunks of dirt flew, as did bodies. The British Vickers gun joined in, hammering rounds into the ripped open German position, and the shocked Hitlerjugend troops took to their heels and ran, leaving four of their seven men dead. “Reloading!” shouted the Churchills co-driver across the intercom. The tank commander had his head out and was scanning the hedgeline just to their front where the 165mm demolition round had gone in. All he could see was smoke and dust. He heard the co-driver’s hatch open and the man reached up and unlocked the barrel of the petard to insert another round. This bit was always nerve-wracking so close to the Germans. The man had to reach up out of the hatch exposing himself and manhandle a large high explosive round into the barrel. If a panzerfaust hit them while they were reloading it would go up and that would be curtains. Shapes moved in the dust by the hedge. The sergeant saw a silhouette carrying a machine gun. “Sergeant?” came the voice of the driver, his foot clearly ready to hit the accelerator in reverse gear and pull them back behind cover. The German right flank now had a big hole in it. The tripod MG42 was still moving, and the panzergrenadier squad called up to hold the flank had been blitzed by the AVRE. The central squad took up positions on both sides of the wooden barn, peppering the British infantry on one flank and cover the paved road on the other. The Panzer IV tore past that MG team at full speed, if it could get up to the farmhouse it had been blasting it could flank the AVRE and hit it point blank with a high-velocity 75mm round. In the meantime the Germans called up their last squad and sent them into the hedgeline where their comrades had just bought the farm. Unfortunately for them the AVRE had now reloaded and hit the fresh SS squad just as hard as the first one. Five more Germans lay dead, including the squad leader. The survivors sensibly took to their heels. Looking around him the German platoon commander saw the shattered remains of two squads, with his support MG still not up and firing. The central squad and tank were still in the fight, but German force morale was now wavering at three points, while the British were still comfortable on seven. Time to break contact and get the wounded out. Two German squads were broken, but all troops were close to their jump off points. Two men got separated in the retreat, but none were captured, so overall a very orderly withdrawal. Overall British casualties had been five men, but only two on a core rifle section. The net result was 1 KIA and 1 wounded. On the German side, much more of a mess. I got 12 kills during the game, but the ones on the tripod MG wouldn’t count. The final butcher’s bill was 5 dead and 3 wounded. Additionally two men had got separated during the withdrawal, although they’d be able to straggle in at a later point. The British CO was a happy chappy, buffing his opinion by two points for that win to total of three (giving +1 support point). The men were happy to have given the Germans such a bloody nose, bringing their opinion up one point back to zero. The British lieutenant’s mood stayed “sociable”, giving +1 on force morale rolls. The German CO was not a happy chappy. Down went his opinion another point, but at -2 overall this still wouldn’t adversely affect support levels. The troops were having a major strop about taking so many casualties (including an NCO), their opinion dropped from zero to -3, which would mean -1 on the force morale roll. Things were looking bad for the Germans, they’d need to pull a win out of the bag soon to try and turn things around. British casualties so far have been light, I’d be two men short in the next campaign turn. Phil’s prospects looked much grimmer, he was facing the prospect of going into campaign turn three ten men down (from a platoon of only 22). Needless to say, Phil decided that trying to hold up my whole platoon plus armoured support with 12 young lads was near suicidal, and opted to give ground. His CO was happy with that and didn’t dock any points of opinion. So the Germans would be abandoning Fontenay, and the next game would be at the farm of St Nicholas in campaign turn 4, which is from 1600-2000 on 25th June 1944. The Germans have now unlocked their Wild Card, and their option to switch to a fresh platoon too. If they fielded their original platoon it would be back up to 17 men as the wounded and missing men returned. Would the Panthers be charging the British line in the next game? Or would the Hitlerjugend break out their fresh troops to try and wrestle control of the campaign away from the British? That AVRE is a beast, and very cheap at only 7 support points. I might adjust that back up to its normal spot of List 9 for the rest of the campaign. Almost all the German casualties were caused by just two shots from the AVRE. To counter this the Germans have to have good AT defence up front. Phil relied on his Panzer IV to get up the table and flank the Churchill. That’s a decent plan but the damage was done before he could get up the road from the entry point. Panzerschrecks aren’t available and the infantry only have the ridiculously short-ranged Panzerfaust 30. The tank scrape to dig in the PzIV is a great pick if there’s likely to be an AVRE rolling up. It means the panzer is static, but you can deploy it right where it needs to be and being hull down the AVRE will struggle to hit it. A PAK-40 is available too. This is probably your best bet if your tank has been killed in a previous game. Don’t forget about the option to interrupt if you get guys caught in the open. I only remembered after the first German squad had shot up my section that hopped over the wall. I played the interrupt to avoid fire from the SFMG and got the whole section out of sight, but if I’d remembered that I had a CoC dice before the first lot fired I could have saved two casualties. Buildings are fire magnets to HE. The Panzer IV was being a proper nuisance to my section in the farmhouse. If the game had gone on their position there would have been untenable. Most of what won and lost this game was dice rolling. The mist didn’t affect me at all, I rolled several double and one triple phases, and I got the kills in when it counted. On the other side of the table, Phil really struggled to deploy anything and his SFMG shot loads of dirt instead of the rifle section it was duelling with. This really was a result decided by the fickle dice gods, hopefully they’ve had their little laugh and we resume normal play next time! Great table and write-up. And painting too! The nicely painted Germans are Phil’s work. My Brits don’t come anywhere near his standards I’m afraid. 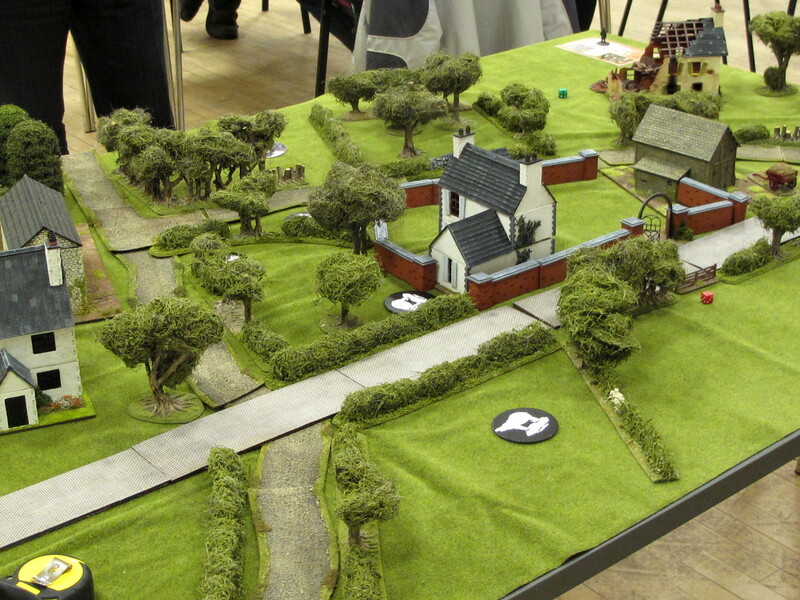 The terrain is a mix of his, mine and the club’s stuff. As always excellent report on the battle. Cheers John. Next game has been played, too. As soon as I sort the maps I’ll put it up, the result is pretty dramatic! Great battle report, though I have one question. From what I recall, the winners of a scenario recover casualties equal to the difference in force morale between them and the loser, but your butcher’s bill seems not to include this effect, is that a personal choice or something from this campaign handbook? I don’t have the actual casualties recorded in the game to hand any more, but we do apply that rule. Although looking back at this report it suggests I took 9 casualties in the battle, which seems like a lot. Hmm. If I did forget it won’t affect things too much, I would have only been one man up in the next game. Ah, I see. I’ve always read that rule as only applying to casualties from the core platoon and not applied it to support losses. That might explain why the attackers have tended to romp through my campaigns with ease. The only thing we count support losses against is the roll for the men’s opinion.